Anytime Bilal meets up with The Roots crew, it’s a huge affair, but this time it was tiny. Literally. The neo-soul, hip-hop progenitors teamed up for NPR’s Tiny Desk concert series, replete with Questlove and Black Thought (Tariq Trotter), to perform “It Ain’t Fair,” their collaboration for the “Detroit” movie soundtrack. The track, an outcry about America’s injustices toward black people, is making its rounds for all to hear, and see. Ironically, a song that has fast become a hallmark of the soundtrack of today’s resistance is from a movie that dramatizes what happened in 1967 Detroit during that era’s movement for civil rights. 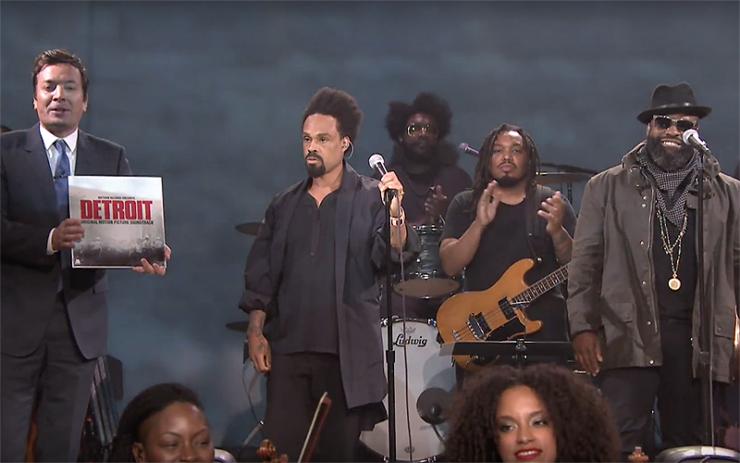 When the song was just released, “The Tonight Show with Jimmy Fallon” cleared the stage for their house band (The Roots), implanted Bilal and Black Thought in a spotlight out front, with a fully functioning orchestra in a simulated pit, right there in Studio 6B, for a riveting live performance.